Shaman Elizabeth Herrera is a healer, teacher, and author of life-changing books. 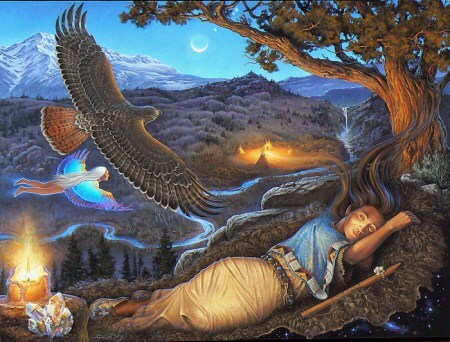 Elizabeth uses shamanic healing (Native American spirituality) to remove negative energy, facilitate forgiveness and release the past so that health, abundance and happiness can more fully enter people’s lives. Always drawn to the spiritual side of life, Elizabeth began her shamanic path in Michigan where she learned to shamanic journey with a certified Sandra Ingerman instructor. Elizabeth continued her studies through the Foundation for Shamanic Studies for shamanic journeying, soul retrieval, and death and dying (psychopomp), but her major source of learning has been from her spirit guides, who offer limitless guidance and lessons on living a more spiritual life. She is also a student of A Course in Miracles, which she has found to be a perfect companion for shamanism. Elizabeth wrote the books Shaman Stone Soup (memoir), Dreams of Heaven, Earth Sentinels: The Storm Creators, and Of Stars and Clay.